Wreck of the ferry M/F "Jan Heweliusz"
Loss of the ferry "Jan Heweliusz"
"On the night of 14th January 1993, a Polish ferry "Jan Heweliusz" sank in tragic circumstances in the vicinity of the Rugen island, and actually some 15 miles off the cape Arkona. A storm was raging on the Baltic Sea, with the wind blowing at the velocity of 160 km per hour. The 12-step Beaufort scale didn’t provide for wind of such crashing power, otherwise unknown on the Baltic Sea. Despite warnings of strong wind from meteorologists, who failed to foresee the coming storm, the "Heweliusz" left the Œwinoujœcie harbor "full steam ahead", setting off for the ferry terminal in Ystad, Sweden. It was Wednesday, 14th January, 11.30 p.m. The weather was dismal, but not catastrophic, with the wind reaching 6-7 and even 9 on the Beaufort scale, which is nothing out of the ordinary for the veteran crew. The ferry’s skipper, Andrzej U³asiewicz, blue water sailing captain of 46 years of age and with 13 years of experience at the post of captain under his belt, was a true professional. A command rang out: "Raise the anchor, we are setting off!" 13th January was a wretched day. The stern port closing off the interior of the train and car deck was speedily overhauled. All the work was conducted at so-called own discretion. Were all the faults removed? Still, haste makes waste. The time was running out. The departure had been already postponed for two hours. To make up for the delay, a shorter route had to be chosen. One more risky, but certainly not as long." What caused the ferry to sink? Eventually, the Maritime Chamber laid the blame on the captain and his crew. Was that the case? There are still many questions and doubts; moreover, it is not universally known that the Heweliusz had had stability problems even before the sinking. The results of an upper deck fire were covered by 30 tons of concrete, laid in order to level out the uneven surface, which must have disturbed the balance of the ferry. The unexplained heel towards the quay at Ystad, Sweden, offers more doubts as to whether the stability of the ferry met the required criteria. Or, is it true that on the night of the disaster the bow thrusters were out of order due to the bad technical state of the vessel? On 12th August we departed for a diving expedition to the wreck of the Jan Heweliusz, which was to prove very exhausting. First, we spent 12 hours on the road from Warsaw, followed by a virtually sleepless night and a dive; barely out of the water we had to return home, which wasn’t as mad as it was draining. Still, we managed to see the remainders of the tragedy which struck in the dawn of 14th January 1993. There were 55 fatalities, 5 missing persons and only 9 survivors. This dive required a different approach. Subconsciously, we were well aware of the seriousness of that spot and its function as an underwater necropolis. 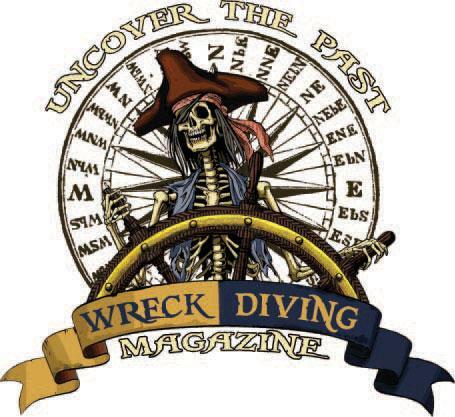 For four years, Szczecin’s Dive Point scuba center had been organizing diving expeditions to the wreck. The atmosphere, description of the events as well as the photo and film materials presented before the descent attested to the professionalism of the organizers; still, this wreck has special significance in the history of Polish scuba diving or Baltic Sea sailing. Our guide and main source of information on the wreck of the Jan Heweliusz, Tomek Stopyra, swamped us with interesting facts that had been unknown to the majority of us. Hopefully, the weather would hold. That thought plagued my mind on the Sunday night of 11th August, just before falling asleep. I had heard stories of diving expeditions that, on arriving at the Heweliusz site, could only take pictures of themselves with the buoy marking the ferry’s final resting place and were forced to return to the port due to high water, which appeared out of nowhere during their journey from Sasnitz to the wreck. But that wasn’t always the case. The skipper of the Brigitte decided to approach the wreck despite high water, causing the passengers to suffer from sea sickness as soon as the vessel left Sasnitz waters, and making them wonder who was the madman that decided on sailing in such weather, the captain or the divers. After a 3-hour cruise, the sea became calm enough that you could teach beginners how to dive the wreck. Arriving in Sasnitz on Germany’s Rugen island was easy indeed. The only complication was the long route and the slow speed of travel on the German side, due to the locals driving by the book. A speed limit was holy to them, which lengthened the travel from the Polish-German border to Sasnitz; however, any nervous drivers insisting on overspeeding set themselves up for a photo op courtesy of cameras installed by the German Police to catch the ’speed demons’. Our arrival was awaited by a ship that was to take us to the Heweliusz site. M/S Brigitte was a vessel transporting tourists around the Rugen island. 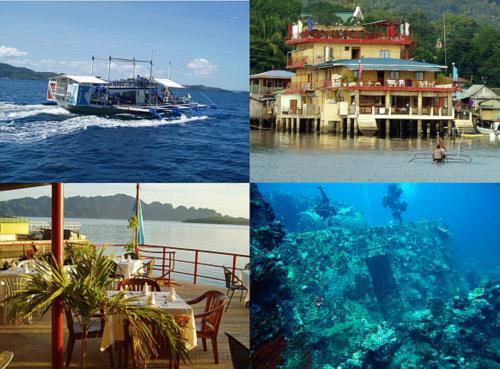 It was the skipper’s main livelihood, while diving expeditions sailed on weekdays. The vessel offered comfortable passage for 20-25 persons. More than that makes life difficult for all the passengers. Fortunately, the ship’s owner had foreseen it, and prepared his vessel for longer expeditions with sleeping accommodations onboard. The shower room, ladies’ and men’s rooms, mini-bar, 30 sleeping places, good-sized mess serving breakfast and dinner, as well as the promenade deck and hot water on tap met the requirements of even the most demanding divers. The sleeping arrangements at M/S Brigitte might have been rather spartan, but we planned to sleep at home. There we intended to see the legend of the Polish Baltic Sea sailing. The skipper left Sasnitz at 6 a.m. on 12th August. The noise of the engines kept some people from falling asleep. At approximately 9 a.m. we arrived above the wreck of the Heweliusz. A big orange buoy marking the final resting place of the Heweliusz was a sign for the passing ferries to sound their sirens and thus commemorate the victims that didn’t survive to see the morning of the unforgettable 14th of January. The ship’s crew had already served us breakfast; it wasn’t Victoria hotel fare, but no one seemed to mind. Not an hour later, all of the expedition participants went under, all 24 of us waiting to experience something exciting, to take in a sight you should see at least once. First, Tomek Stopyra described the wreck, diving conditions and safety, providing us with several details of the ferry’s history that were unknown to most of us. At the moment of sinking, the Heweliusz was transporting 28 trucks loaded with, for example, light bulbs, which could still be seen under the wreck’s starboard (now: ceiling), onions, blood plasma and empty bottles. Its holds also carried 10 train carriages, but access to them is impossible. After descending down the dive line, it took me almost 15 minutes to realize that I was swimming towards the ship’s bow. The water clarity was medium, i.e. before the termocline level at 17 meters it extended to 3-4 meters and deeper underwater it measured approx. 10-12 meters. According to Stopyra, it was only poor. Therefore I know that I have to return to the spot, hoping to see it with better water clarity. The first dive lasted for 50 minutes. 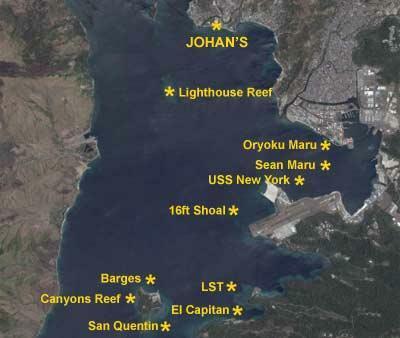 In my mind, I still hold the general outline of the wreck. The best part of the dive was the view of the Heweliusz bow. It was the optimal vantage point to observe the scale of the tragedy and the large size of the ferry, which measured 125 meters. The dive line descended down to the railing on the starboard of the Heweliusz, close to the stern. It rested at the level of 10 meters, offering a good spot to start the dive from the stern side, where you could catch a view of the propeller and the rudder. More importantly, somewhere on the stern side, between the ship’s hull and the sand, a small family of codfish would be usually found, only to be chased off by the underwater crowds. The stern port couldn’t be seen at this spot, as the Heweliusz keel lurch caused its loss some 700 meters from the current resting place of the wreck. The wreck settled on the portside, with the keel facing southwards, which made taking any good photos impossible due to the shadow. By the mooring place of the dive line, German divers placed a memorative plaque, urging visitors to show consideration and respect for the wreck, and refrain from taking anything found underwater. However, it was only a request, leaving every diver to do as s/he pleased. Still, I would like my readers to sympathize with the tragedy of 5 persons, whose bodies were never recovered. All the evidence suggested that as the ferry toppled over, they were still in their cabins, which soon became their final resting places. 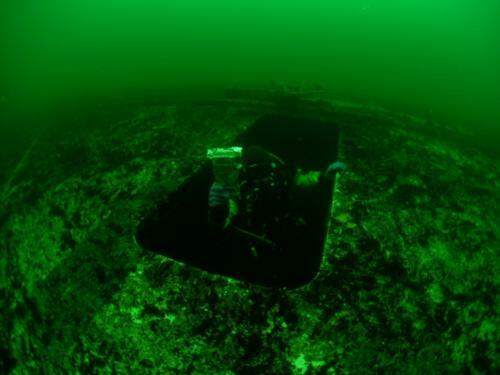 The color and shape of the wreck no longer resembled the vessel that had sailed the Baltic Sea just 9 years ago. Millions of mussels and barnacles covered every element of the ship. There were hardly any spots without the crust, and in some places rust pits were showing. During that dive I found a fragment of concrete cast from the passenger deck, which apparently was not mentioned in the ferry’s overhaul documentation. The piece of concrete rested on the sandy bed some five meters from the wreck. Just to be safe, I took a picture of it, and during the break between the dives, Tomek Stopyra and his Divemaster raised the piece onboard of the Brigitte. The piece had the potential to become material evidence during the new inquest into the loss of the ferry. After a not particularly big dinner consisting of soup mixed with the second course, prepared by one of the crewmen, we descended for our second dive. The weather conditions were acceptable. It was approximately 22 centigrade with slight wind. Unfortunately, the sun was clouded over, making the wreck even more gloomy and dark. The water was warm, with surface temperature of 17 centigrade and 7 by the sea bottom. Any diver could survive in such conditions, even a person in a wet suit. Due to better orientation at the wreck, every diver considered the second dive to be superior. Finally we could concentrate on visiting the decks. The height of the Heweliusz could only have been compared to a smaller apartment building. At the level of 17 meters 5 decks were located. The lowest deck featured double bottom covered by the train deck, which in turn was followed by the car deck that carried several trucks. The trucks could still be seen during the dive, spilling from the wreck like toy cars sticking out from a drawer in a child’s room. The boat deck with passenger cabins was separated from the hull during the ferry’s drift and rested just a dozen or so meters from the wreck; similarly, the command deck with captain’s bridge was also severed from the main part of the vessel, as well as severely damaged and stuck into the sand. During that dive I managed to observe the propeller and the stern rudder, as well as the car deck. The sight that appeared before me looked almost like two seperate car decks that failed to stick together. That was one reason to return to the site. A dozen trucks I managed to see gave me a view of the tragedy that happened at that spot. It was difficult to describe in a few words. It had to be seen. The biggest pile-up on the highway does not leave so much mess. Another reason to return to the site were photos. Some of the photos I took during the first dive were unusable. The light and water clarity was too tragic for the photos show; moreover, during wreck diving no one really notices the smallest creatures that inhabit the wreck’s sides and require very careful dive. Prawnfish, eels, mussels, barnacles, bullheads, gobies that had only recently populated the Baltic Sea in masses, as well as medusas. All the species were great subjects for macro photography, but who would think about shooting 2-3 cm objects during a dive at a 125-meter long wreck. Still, you should spend your second dive on observing the creatures living just below the edge of the Heweliusz starboard. We will be in Xcaret Mexico Jan 18-30, 2013 doing cenote and wreck diving.